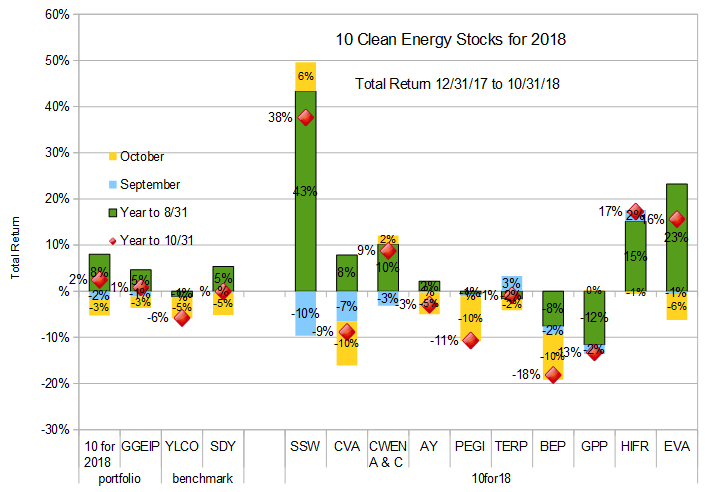 After a fairly brutal September and October my Ten Clean Energy Stocks model portfolio is barely hanging on to positive territory for the year (up 2.4%) as is the private portfolio I manage, the Green Global Equity Income Portfolio (GGEIP, up 0.8%). Yet I can take comfort in superior relative performance, since my broad dividend income benchmark SDY is now down 0.1% for the year, and the clean energy income benchmark YLCO has fallen 5.8%. All returns are total return after fees and dividends. The strong relative performance in a weak market is most likely due to the conservative nature of my picks, and mostly positive third-quarter earnings, the details of which I will discuss below. At the end of September, I emphasized that my top “stock” pick was cash rather than any particular stock, saying “This month’s pick is… increasing your cash position…, but if you really want to buy a stock, try GPP, CVA, or Brookfield Renewable (BEP).” This turned out to be a good call with the model portfolio down 3.4% for the month and the benchmarks down 4.8 and 4.6%. These picks were up 0.1%, down 9.6%, and down 9.9%, so I’m glad I pointed to cash as the best investment. I’m not confident that the correction is over, but we seem to be heading into a temporary lull, and so I’m going to abandon cash as my top pick for November. I liked third quarter earnings at Covanta (CVA) and even as the market sold the stock, and I continue to believe that both Green Plains Partners and Brookfield are undervalued, so I will maintain these as my top short term picks. Below I describe each of the stocks and groups of stocks in more detail. I include with each stock “Low” and “High” Targets, which give the range of stock prices within which I expect each stock to end 2018. Leading independent charter owner of container ships Seaspan reported a strong third quarter, and the stock shot up, losing the water it had taken on since its high in June. Although I feel the company still has good potential for further gains as the recovering containership market floats all boats, it is time for me to bail on this one. During the quarter, Seaspan agreed to make a $200 million investment in Swiber Group, including a $180 million investment in a Liquefied Natural Gas (LNG) to power project in Vietnam. Seaspan’s green credentials were always more marginal than most of my other investments. While Seaspan’s vessels are generally more efficient than other containerships, there is some question as to if the global container shipping industry has a net positive or negative effect on the environment. On the plus side, if we assume that a certain quantity of goods is going to be transported one way or another, container ships are clearly the most efficient way for that to happen. On the other hand, if the low cost of container shipping boosts global consumption of stuff we don’t really need, or if it enables those items to be manufactured at lower costs in locations with lax environmental standards, the industry does net harm. Given the arguments both ways, I was willing to consider Seaspan “green” because its ships are generally best in class from an efficiency standpoint, but now that the company is directly investing in the transportation and use of fossil fuels, I feel it’s time to exit with my gains. Disclosure: Long PEGI, NYLD/A, CVA, AY, SSW, SSW-PRG, SSW-PRD, SSW-PRH, TERP, BEP, EVA, HIFR, GPP, AQN.